If we had started our new wine club last year, this most certainly would have been one of the choices to include in a monthly shipment. DeLille Cellars has been making outstanding wines for years, with several levels of releases including Chaleur Estate, Grand Ciel upper-end Cabernet and their Doyenne series. Their Chaleur Estate Blanc was recently placed in the Wine Enthusiast Top 100 Wines of 2008 at #74, and the Doyenne Aix was placed at #43 in the Wine Spectator Top 100 as well. 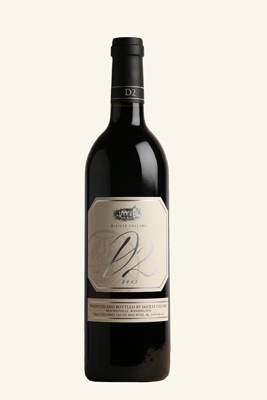 The DeLille Cellars D2 blend of Merlot, Cabernet Sauvignon, Cabernet Franc and Petite Verdot is a prized example of strength and structure coming from Washington’s best growers and winemaking talents. “Complex nose of red currants, cedar, pencil lead, white meadow flowers, and mocha. The freshness and lift on the palate definitely represents the 2006 vintage, with red currants and mulberries supported by toffee and vanilla oak notes.” is the winery’s apt description for now. As the months progress, I expect a depth and fullness gaining ground over the freshness. This wine is available at Salut! Wine Co. for $36.99, or available to wine club members for only $31.44!